Cannonball, SD – On April 1st, 2016, under the name “Chante tin’sa kinanzi Po”, tribal citizens of the Standing Rock Lakota Nation and ally Lakota, Nakota, & Dakota citizens will set up a Spirit Camp along the proposed route of the Bakken Oil Pipeline, “Dakota Access Pipeline [DAPL]”. The camp will be called “Iŋyaŋ Wakȟáŋaǧapi Othí”, translated as Sacred Rock Camp, the original name of the area around Cannonball, North Dakota. This Spirit Camp is dedicated to stopping the construction of the DAPL, while raising awareness of the negative impacts associated with pipeline spills and the necessity to protect the water resources of the Missouri River. The group’s name in Lakota, “Chante tin’sa kinanzi Po”, translates as People, Stand with a Strong Heart! 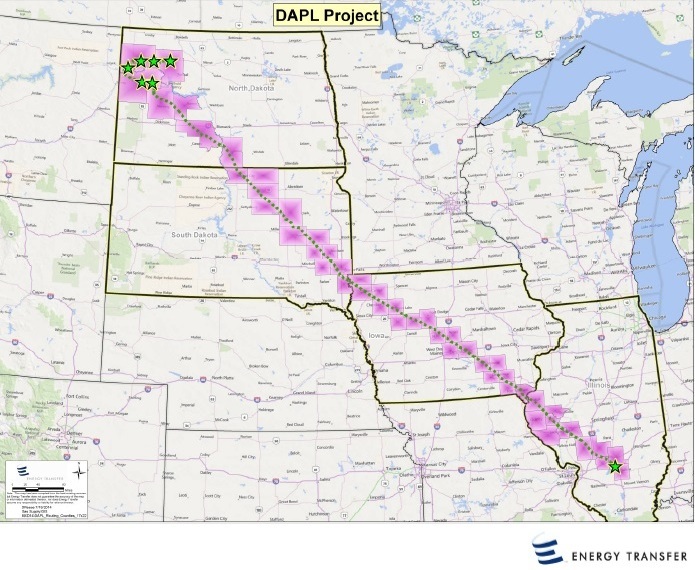 The Dakota Access Pipeline (DAPL), owned by Energy Transfer Partners, L.P., is proposed to transport 450,000 barrels per day of Bakken crude oil from the lands of North Dakota to Patoka, Illinois. The pipelines construction comes despite the recent downturn of oil prices which caused North Dakota’s oil boom to bust plunging the state into a billion dollar deficit. The downturn in oil prices has caused oil companies focused on Fracking in North Dakota to file for bankruptcy and calls to question the viability of fracked Bakken Oil in the future. Despite these downturns in the oil industry the pipeline construction is set to move forward. The threats this pipeline poses to the environment, human health and human rights are strikingly similar to those posed by the Keystone XL. The DAPL will cross over the Ogallala Aquifer (one of the largest aquifers in the world) and under the Missouri River twice (the longest river in the United States). The possible contamination of these water sources makes the DAPL a latent environmental hazard even before the oil is burned as fuel. The construction of the DAPL will threaten everything from farming and drinking water, to entire ecosystems, wildlife and food sources surrounding the Missouri. The nesting of bald eagles and piping plovers as well as the quality of wild rice, and medicinal plants, like sweet grass, are just a few of the species at stake here. Tribal citizens are inviting everyone to stand with them against the threat to their health, culture, and sovereignty. They ask that everyone who lives on or near the Missouri River and its tributaries, everyone who farms or ranches in the local area, and everyone who cares about clean air and clean drinking water stand with them against the Dakota Access Pipeline. This article was adapted largely from this press release.